H2 Designs: The Paper Players Challenge #106 - Tic Tac Toe! The Paper Players Challenge #106 - Tic Tac Toe! 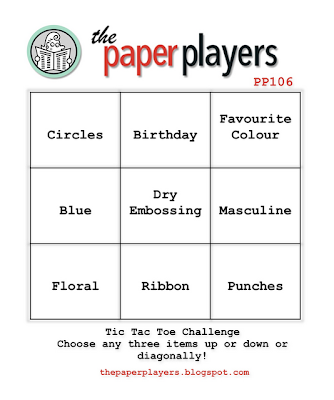 This week The Paper Players are holding a Tic Tac Toe Challenge. I absolutely love these challenges as they are a great springboard for ideas, by offering lots of different options, as there are 8 possible combinations to try! You've probably already noticed that I am an easy pushover for anything blue, particularly the aqua/teal tonings. Here I've used Baja Breeze & Island Indigo. I've teamed these blues with some crisp white, which has been scored with the diagonal score plate. Sorry, but I just couldn't capture the colour of the flowers accurately, the large flower is much deeper IRL even though it looks kind of turquoise in these photos! :( Actually the whole photo is kinda dodgy! - the panels are cut straight, but the perspective is all skewed & the colours are off, so this is one of those cards that look much better in real life than in the photo! !